Canoeing is a popular activity at Battelle Darby Creek Metro Park near West Jefferson. As the warm months of summer have arrived, so has a popular activity at Battelle Darby Creek Metro Park for those looking for a little adventure. Whether someone is looking for a peaceful getaway or an alternative way to exercise, the creek offers a little bit of everything for those who want to try their hands at canoeing. While paddling along the creek, Granados suggests keeping an eye open for wildlife. Before heading out to Battelle Darby Creek to canoe or kayak, Granados says there are several things visitors should keep in mind. 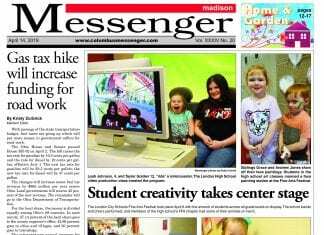 Metro Parks does not have any equipment available to rent. However, there are other places nearby such as Trapper John’s where equipment is available, he said. State law requires all boats must be registered and people must wear their personal flotation devices (PFDs), he said. 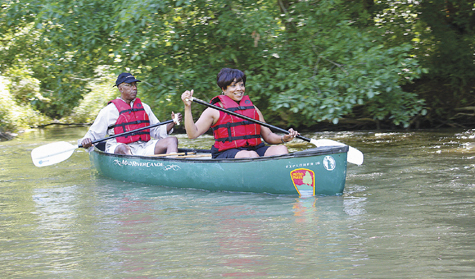 Battelle Darby Creek offers two canoe access points. Most people will begin at the northern access point, located near the confluence of Big and Little Darby Creeks, and end at Osprey Lake, which is further downstream, he said. There is also a public canoe access location for Big Darby Creek in Prairie Oaks Metro Park, which is north of Battelle Darby Creek Metro Park. Depending on the creek condition, people of any fitness level can participate, Granados said. “When the water is moving a little faster, it is wise to have prior instruction and experience, as conditions can dictate different responses and fitness requirements,” he said. When the creek is moving very fast, naturalists do not recommend kayaking or canoeing on the creek. For those wondering the difference between a canoe and a kayak, Granados says there are a couple key distinctions, including the seating position. A canoe also has a paddle with a blade on one end, while a kayak uses a paddle with blades on both ends, Granados said. A typical canoe will have seats for two, while a typical kayak will be for one person. For more information on canoeing and kayaking at Battelle Darby Creek, go to metroparks.net.